If I could use a word to describe this show, it would be just that: “simple.” The show is simple in all respects. There’s just nothing here to chew on. Each episode is pretty much 24 consecutive minutes of flavorless air. In fact, this post will be short precisely because the show is so simple. 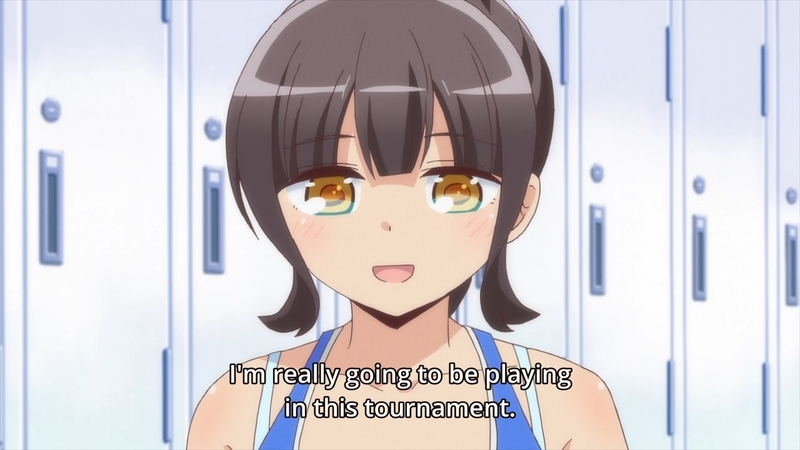 The qualifier tournament is coming up, and Akari is worried. Why? Well, everyone initially thought that the island could send two teams to nationals. Unfortunately, this is no longer the case. Akari is worried that if her friends end up playing against each other, this will tear the club apart. Um, really? Aren’t we being a bit hyperbolic here? But yeah, that’s the crux of the drama for the first third of the episode. 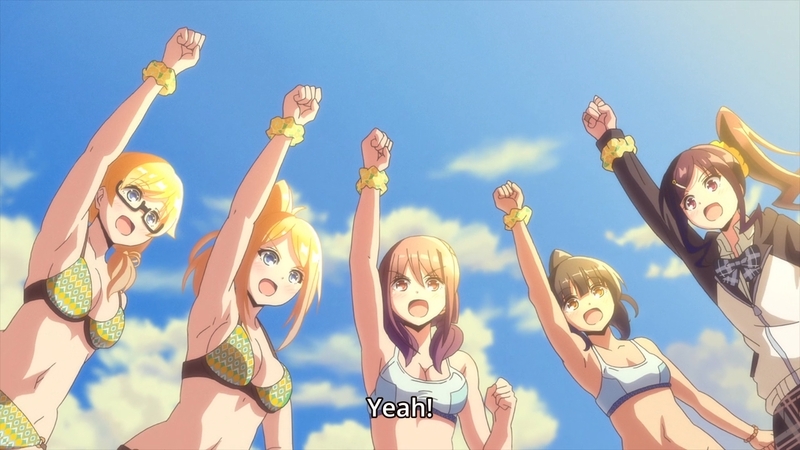 The girls simply rally around Akari and assure her that nothing could get in the way of their friendship. And in return, she gives them all scrunchies. Meh. We waste the next third of the episode on tying up some loose ends. 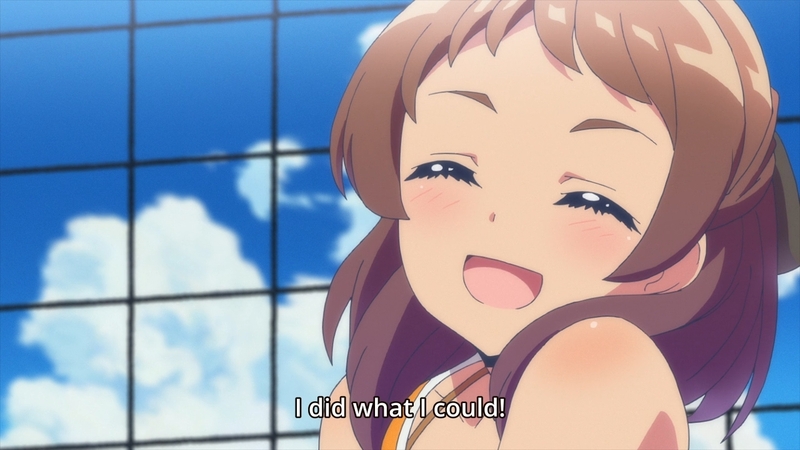 At the tournament, Kanata is pleased as a peach that she can compete in a real event. Cool. 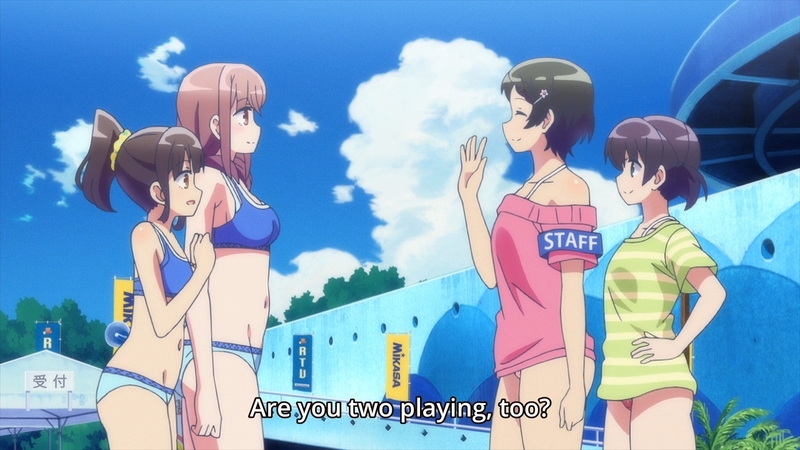 Haruka and Kanata meet up with Mai and Ai, but the latter two won’t be playing. After all, Ai has already graduated so that’s that. Maybe they can play in college or something. Our heroines then proceed to win their first match with ease. They win so easily that we don’t even get to know who they played. The opponents were simply not that important. 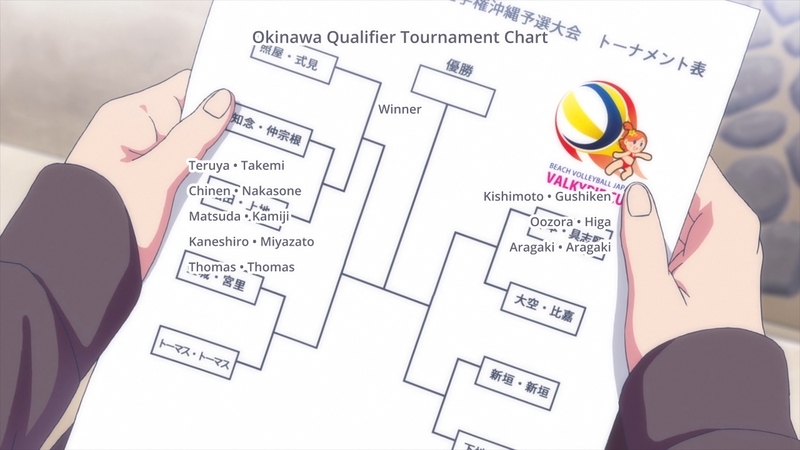 In their second match, they get to go up against the Arakagi sisters. 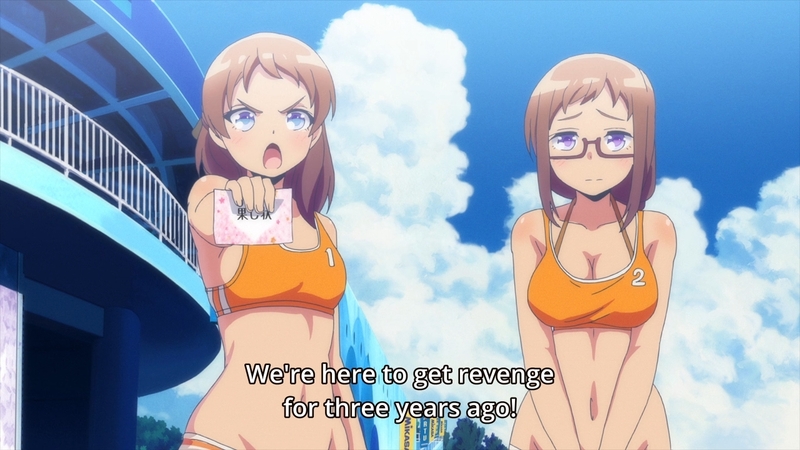 The Aragaki sisters had lost to the Thomas twins in middle school, so they’ve been training hard for the past few years just to get their “revenge.” But this is Harukana Receive, so there truly isn’t any bad blood between any of the girls. 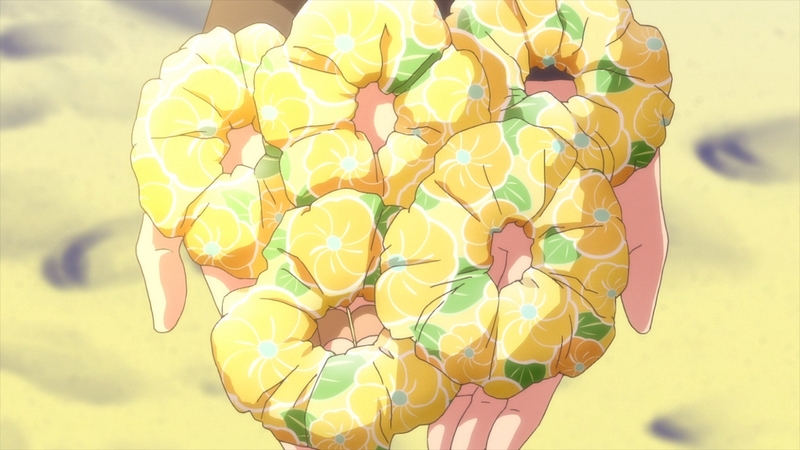 Plus, they’re going to have to get through Haruka and Kanata, and we already know that they won’t. 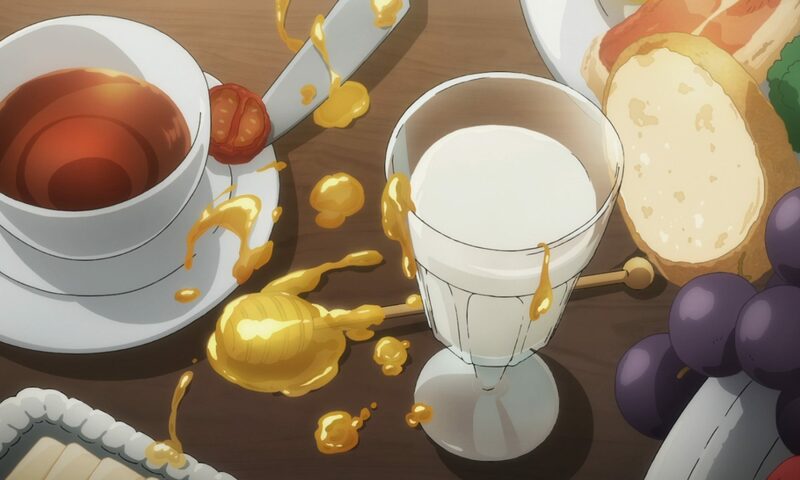 Nevertheless, the last third of the episode is devoted to this very match. Unfortunately, it isn’t even a close one. Our girls quickly race out to a 7-0 lead in the first set. The Aragaki sisters can only get on the board by pulling out their secret weapon: the top spin serve. So top spin on a ball makes it drop suddenly. In tennis, a top spin shot allows players to hit as hard as they can without worrying about the ball going long. Also, when the ball bounces off the court, it tends to kick up real high. Pro players can make the ball bounce up around your shoulder level, which makes it difficult to return the ball. This is how players like Nadal have dominated the sport. 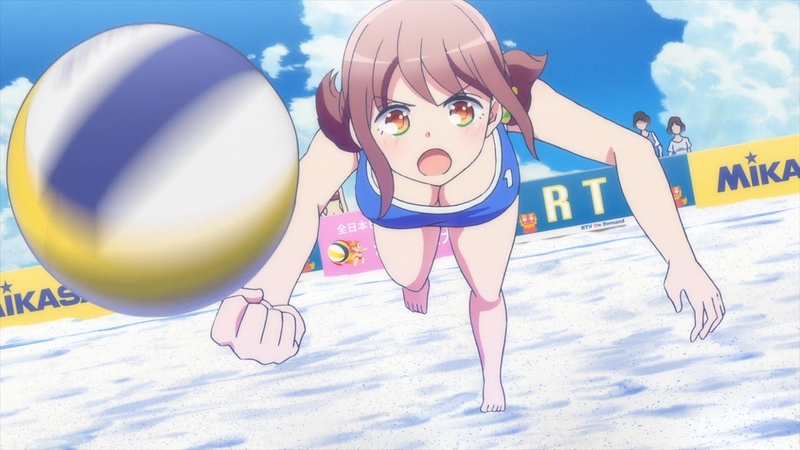 Well, in volleyball, the ball isn’t allowed to bounce to begin with, so I’m not sure what other advantages you get other than making the bottom drop out of the ball’s trajectory. Generally, flat shots are faster in tennis. I assume the same is true in volleyball. That doesn’t mean that a top spin shot has less force behind it, though. Anyways, enough of that nonsense. Even with the top spin serve, the Aragaki sisters lose in straight sets. They also lose pretty badly both times. They’re not too bothered about it, though. 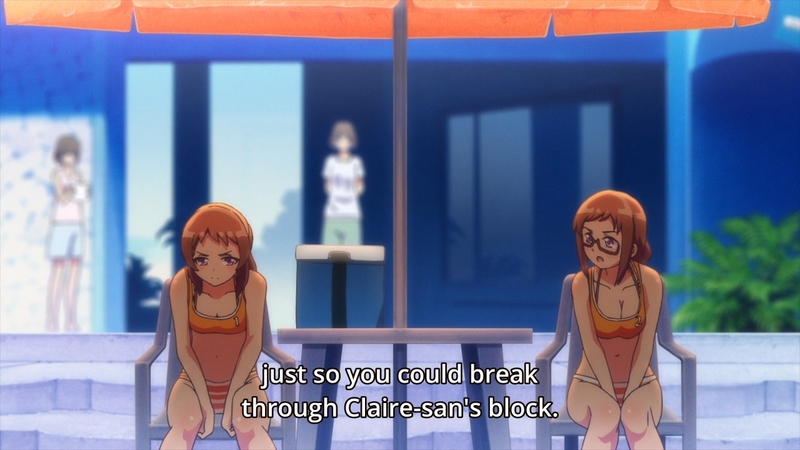 Hell, they probably could’ve scored more points if they weren’t so deadset on breaking Haruka’s blocks. So basically, Haruka has learned a lot from Claire, and as a result, her game mirrors the blonde twin. 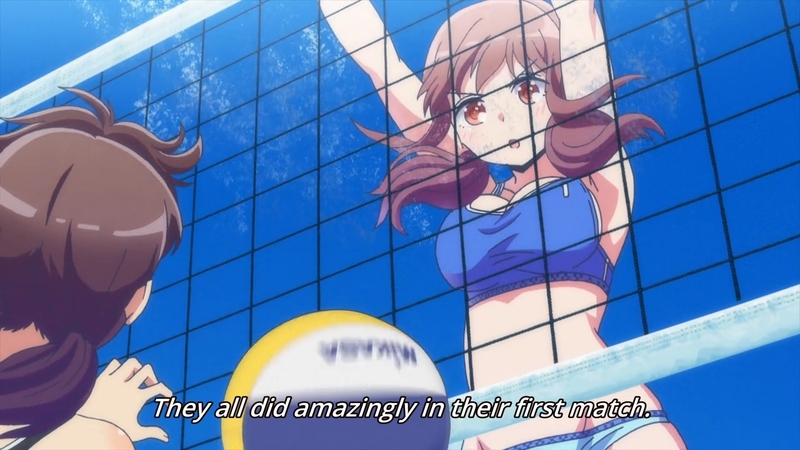 This is why the Aragaki sisters got so fixated with just getting pass her blocks. But Haruka still has Kanata behind her, and blah blah blah teamwork owns. And with their second win under their belt, they just have one match left: the finals against the Thomas twins. This is for all the marbles, boys. Whoops, I meant girls. Silly me, there are no boys on this island. Like I said, there isn’t much to this episode. There isn’t much to this show either. 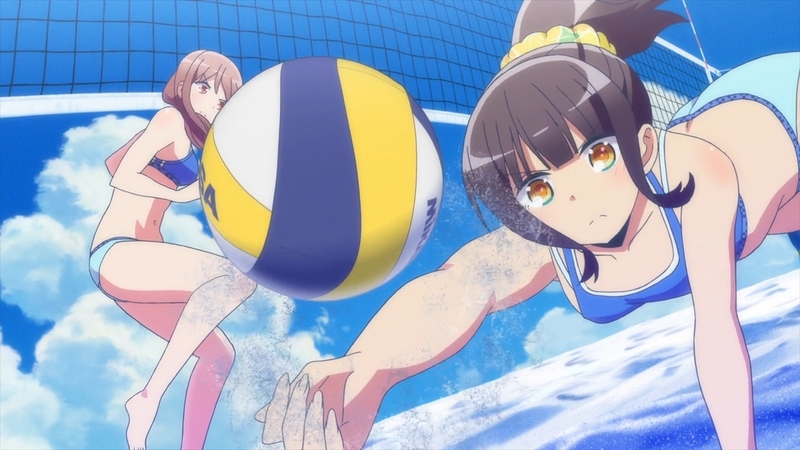 Unlike other sports anime, Harukana Receive doesn’t have the animating chops to show us the action that we desperately crave. That’s why the anime has to rely on slow motion and close-ups all the damn time. It’s just too simple. Previous PostPrevious Shichisei no Subaru Ep. 9: It’s been six years!